But she happens to be my significant other. So, there is no way I am going to kick her out. Sleeping next to her is unbearable, unless I am wearing the best noise cancelling ear plugs that money can buy. It is not easy to sleep with someone who snores. I have been there, done that, and I didn’t like it. Get yourself the best earplugs for sleeping with a snorer. Honestly, using these earplugs for sleeping will save you from so much agony and many sleepless nights. However, if you are not up for the idea of sleeping with earplugs in your ear canals, you may want to consider getting one of these white noise machines that are also good at blocking disruptive noises at night. See Also​ Another great idea would be to buy a snoring mouthpiece for the snorer in the room. 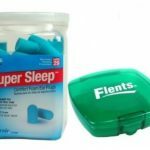 I have done a thorough review of the best mouthpiece for snoring here..
WHAT SHOULD YOU CONSIDER WHEN BUYING EAR PLUGS FOR SLEEPING? COMFORT- CAN YOU SLEEP WITH THE EARPLUGS IN YOUR EARS? Silicone vs Wax vs Foam: Which are the most effective earplugs for sleeping? The Body Heat… Part of the solution. More than just for snoring noise! Wax earplugs are very simple to use! More than just for sleeping with a snorer! Silicone earplugs are easy to use! Roll’em, push’em, but wear them! So, where shall we go now? Many of the snoring earplugs available in the market are blatantly overrated. They won’t block out the sound of mice laughing in the attic, leave alone the snoring sounds of a 160 pounds man sleeping next to your ears. There are a few best sleeping earplugs that do what they promise. Here is a list of my very best. You can pick any from this list and rest assured that you won’t be disappointed. The best earplugs for snoring should block out most, if not all, noise. That’s why you are buying them in the first place. They should have a rating of ideally 30NRR and above (the highest has a rating of 34NRR). Snoring earplugs made from foam and wax have so far proven to be the most effective. When inserted into the ear properly (regardless of how small your ear is) the foam expands forming an airtight seal blocking out most if not all noise. It is not bad to sleep with earplugs every night, if you are doing it to save your marriage or your eardrums from damage by snoring. But if you thought sleeping near a snoring person is bad, try putting on uncomfortable earplugs. They apply pressure on the eardrum. The pain from such pressure is excruciating, and they may even cause a condition known as ear barotrauma. Good earplugs should fit into your ear canal perfectly. They should neither stick out like antennas nor go too deep. They should also not leave a space between them and the ear. Ideally they should form an airtight seal. If they don’t, they will let in the snoring noise. When buying sleeping ear plugs, make sure they are the right size for your ears. Some of us have smaller ear canals than others, it is therefore important to choose those that are your size. In short the best earplugs for snoring should offer you the maximum comfort regardless of your sleeping style while at the same time blocking out the irritating snoring noise. This goes without saying. You don’t want to log into Amazon, Ebay or Walmart looking for replacement earplugs after every few months. Although most earplug brands are quite affordable, what you settle for should give you value for your money. It should be reusable, withstand cleaning and maintain its shape and size after a few uses. The EAR Classic earplug is probably the most popular earplug on the market today. It has been available to the consumer for more than 30 years, and was the first foam earplugs to ever be manufactured. Almost everyone who reviews sleeping earplugs knows about 3M Classic earplugs. They have a signature yellowish cylindrical shape and specialed texture surface. I’ll go thru all the characteristics advertised by Aearo so that we can see if it is actually what they are supposed to be. The material used with the 3M EAR Classic earplugs is definitely different from other plugs I have used in the past. At first touch, the main body of the plug is kind of rough but the two endfaces are very soft. This roughness is due to the plug special proprietary cell surface texture. The soft endfaces helps make the seal. The earplug is more stiff to compress than other types of foam earplugs and it has a slower recovery time which makes them actually easier to insert inside the ear because the plug takes more time to regain its original size. One of the downside to this PVC formulation is that since the recovery time is longer than other plugs, you have to keep your finger on the plug while it regain its size in the ear. If you don't keep a finger on it, it has a tendency to get out of the ear, not providing with an optimal noise reduction fitting. This effect is probably due to it’s cylindrical shape. Sometimes, It even needs to have it taken out, re-rolled, and re-inserted in the ear canal again. The special PVC and cell surface texture do actually help keep the pressure inside the ear very low when inserted. This is due to the fact that the cell surface let air thru the earplug as is expand in the ear, creating a pressure balance, compared with push-in type of reusable and disposable earplugs that prevent air inside the ear from coming out, though, creating an air pressure inside the ear when inserted. I could not test the plug for the humidity factor because I don't use them in sweaty conditions. Although I have noticed that the plug tend to be easier to remove from my ear when I pull on it. I guess that because of the special cell surface, the plug does not tend to become humid and stick to the inner canal like other disposable foam plugs. Aearo state on their brochure that the cylindrical shape as been tested to be the best shape for protection. Although it does actually make a prefect fit when properly inserted, and that there are studies backing their claim, I don't particularly believe that tapered earplugs provide less fit and protection than the cylinder type. On the contrary, I find the cylinder type more difficult to insert in the ear that the tapered ones for one reason: when it is rolled, the flat end face of the earplug tend to get deformed and turn into a ball that is sometime hard to insert in the ear canal, compared with a Taper type where the tip stays tapered even when compressed. So, it makes them difficult to insert correctly on the first roll, compared to the tapered plugs which provide a perfect entry on the first try due to it’s form. But when it is inserted properly, it does fit nicely in the ear canal and provide an excellent noise seal. If you want to use this type of plugs and have trouble putting them in or figuring out if they are properly positioned in the ear, the Classic Superfit model provide you with a visual indicator on the plug to confirm a proper fit. The flat end face of the earplug tend to get deformed when rolled. Although I don’t use earplugs in a high noise environment, they have been very helpful for me against my partner snoring and my noisy neighbors high volume music. They are very comfortable to wear all day long. I do use them at night because, compared with the regular tapered earplug type, they don’t create moisture in the ear which makes them very comfortable to wear all night. All manufacturers of earplugs advise that these should be used only once. I tend to agree if you are wearing them for high noise protection. But if you use them like me, then they can be reused a few times before throwing them out. I have found that they can be used from 1 to 2 days before they lose their property of slow recovery. Which makes them harder to insert after a while because they recover too fast to insert them properly in the ear canal. 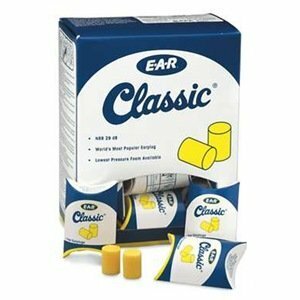 The Ear Classic earplugs are easy to insert, provide a perfect seal when properly inserted, are very soft and comfortable when worn a long time. At first, these were not my prefered choice when I needed disposable plugs. I was going more with Hearos Ultimate softness and Howard Leight Max. But I found by using them a few times for this review that I had been underestimating these earplugs. I actually find them way more comfortable than other sleeping earplugs when I need to wear them for a long time. They are now my prefered all-day earplugs. 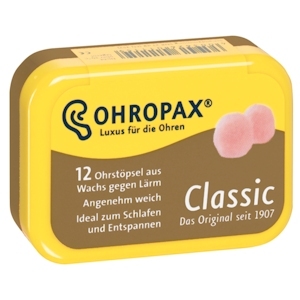 OHROPAX Classic has been a well-established noise protection product since 1907. According to the manufacturer’s website, its unique composition of cotton wool soaked in a mixture of petroleum jelly and a variety of paraffin waxes was so well conceived from the outset that it has barely changed right up to the present day. Ideally used for sleep, relaxation, a sense of well-being and meditation. They are also recommended for use during work requiring concentration, DIY activities and loud music. They are particularly suitable for use in so-called ‘non-classic noise areas’ such as large offices and computer centres (noise level: <75 dB(A)). 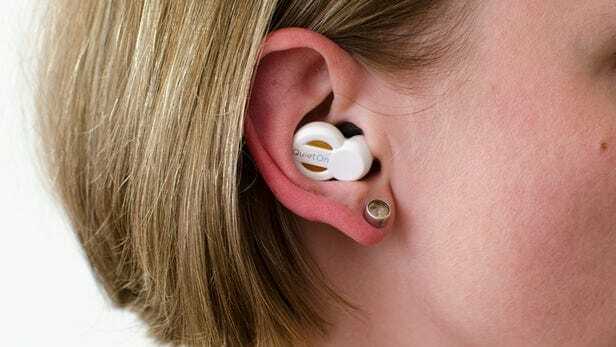 Once they have been inserted into the ear, they are immediately ready for use, in contrast to foam earplugs, you do not have to wait for these plugs to expand. They do not cause sweating and pressure inside the ears. They are considered to be extremely tolerable. They contains no ingredients that are known to cause allergies. Because OHROPAX Classic cannot be cleaned, they recommend that you only use these earplugs once. This product may be affected by certain chemical substances. Sudden or fast removal of the earplug out of the external ear canal may damage the ear drum. Due to the materials used, OHROPAX Classic is not suitable for use in warm workplaces or those containing large amounts of dirt and/or dust. OHROPAX Classic exhibits high sound insulation values over the entire frequency range. The level of protection goes from 22.3db to 37.7db according to the frequencies that the user is exposed to. A chart displaying the entire chart is available on Ohropax official website. I’ll go thru all the characteristics advertised by Ohropax so that we can see if they are actually some of the best earplugs for sleeping. When you open the cardboard box, the first thing that you encounter is a couple of soft little balls of pink cotton wool. The actual earplugs are hidden inside those little balls. The cotton is used to protect the plugs in the box and to prevent them from sticking to each other. Once you have removed the cotton from the plugs, wich is very easy by-the-way, you will be left with a hard pink cylinder made of a sticky material. It’s the petroleum jelly and paraffin waxes that gives it this sticky feeling. Don't worry if you can’t remove the cotton wool completely. As long as you remove most of it, the rest will meld with the plugs material. Ohropax Classic ear plugs in their cardboard box. Ohropax Classic with its cotton protection removed. The shape of the Ohropax wax earplugs is very simple. When you remove the cotton wool from the earplug, you will find a cylinder shaped piece that is in fact pretty hard before it is kneaded. Unlike other earplugs of different shapes, there isn’t much more to be said about the shape of these plugs. The Ohropax wax earplugs are pretty easy to carry almost anywhere. Depending of the quantity that you buy, they come either in a small cardboard box or in a metal container. The cotton wool that serve as a protection is very easy to remove from the plugs. I put it back in the box after removing it so that I can use it to put the plugs back in the box after using them. Although Ohropax says that it is better to use them only once, I have used them a few times before throwing them out. Of course, this always depend on your usage of the plugs. When they get dirty and do not stick anymore, just get rid of them. The wax cylinder, as hard as it can be at first, is actually pretty easy to knead once you start heating it a little bit with your finger. It becomes very soft after a few seconds to a minute of kneading. As I have stated before above, these earplugs are actually pretty easy to knead and to form into a ball shape. I had some difficulties at first to make them stay into my ears, which prevent them from completely sealing my ear canal. When I pushed them in the ear, they were also sticking to my finger, which made the plug a little bit difficult to make it stay inside the ear. When they are kneaded, they tend to become very soft. Because of this, it takes a few minutes before they become a little bit harder again when inserted in the ear, which gives the impression that the ear canal is not completely sealed from noise. One of the big downside of using this kind of material is that, after kneading the earplug, your fingers become very sticky with the wax material. I would have actually thought that after scrubbing my fingers together it would actually come off… but no. Your fingers will remain very greasy. And it won't go away as long as you don’t wash them with soap and water, which is not very interesting for me because I have them in a bedside drawer to put them at night when my partner is snoring. So, I’m not really interested in getting up and washing my hands after putting on the plugs. It would be hard to fall back asleep after getting up. It can also be a problem in other situations where you have to put on the plugs but cannot wash your hands afterwards. Ohropax Earplugs rolled into a ball. 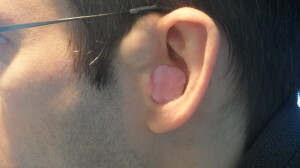 Ohropax Earplugs inserted in the ear. They are actually very comfortable to wear. They do not cause any pressure inside the ear. They can be used for noise and also to block water. They are easy to knead, to put on and to remove. Although not recommended, they can be reused a few times. They comes in the color of your skin and thus they are almost invisible. They leave a sticky film on the fingers after being kneaded. Can be difficult to keep them sealing the ear canal before they cool down and get harder. Keep sticking to the fingers when putting them in the ear, which make ear canal sealing a problem. When sleeping with them they tend to leave grease on the pillow or fall during the night. 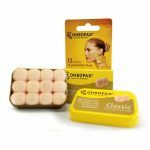 Ohropax wax earplugs can be a perfect choice for some people who dislikes disposable earplugs, or if they have skin reactions to non-natural products. One of my favourite advantage is that they are made from natural material, which makes them biodegradable. So these plugs are actually very environmentally friendly. The other advantage is that they are made from non allergic material. So, this gives the chance to everyone, even if you have skin problems, to use earplugs. If you experience pain when you use foam earplugs, you might want to try these earplugs. 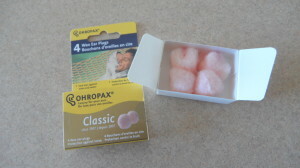 Ohropax wax Earplugs are painless to insert and do not fall of at night. Unlike the foam earplugs, you do not have to hold and wait for them to expand like. They take the shape of your ears the moment you insert them. They have a rating of 27NRR which is a bit lower but still quite effective in reducing the snoring noise. They might not totally block it out but still allow you to sleep comfortably next to your partner. These babies are made of wax covered in cotton. They are comfortable easy to insert and ideal for all ear sizes and shapes. These were some the best earplugs for snoring that I came across on Amazon. I particularly liked them because they are made of polyurethane foam. The Hearos Ultimate Softness as the name suggests are very soft and comfortable. These earplugs did not stick out when I wore them. They are perfect for side sleepers like me. The best earplugs for sleeping have a rating of 32NRR the highest you will get is around 33NRR. This means that they will block out most of the unwanted snoring noise allowing you to have a peaceful sleep besides you snoring partner. The earplugs are very easy to use. I just rolled out the plug in between the thumb, and the index finger to form a thin cylinder. I then gently lifted my ear robe with the hand and inserted the cylinder. I used the index finger to hold till they expanded to fit. This happened quite fast. They expand to the size of your ear canal forming an airtight seal. Not too loose to fall out and not too tight. Click the button below for the best price on Amazon. They block out snoring noise but will allow you to hear your alarm ring in the morning. These earplugs have the highest rating of 33 NRR. They totally block out all the noise. With a pair of these, you might not even hear your alarm ring if you are a heavy sleeper. They are made of soft foam which makes then comfy to wear and sleep in. They have a soft finishing that does not irritate the ear. Moldex 6800 Pura Fit earplugs are longer in length which makes them easy to put and remove them. They work best with those with longer ear canals and back sleepers. However if you have longer canals they will work perfectly regardless of your sleeping position. They are easy to insert and have a firm grip in the ear. They expand to fit the ear in seconds after inserting them. They do not keep falling off. If you are worried they will go too deep, there is a corded mode. They are affordable and durable and easy to clean. They are long making them uncomfortable for those with shorter ear canals. The Howard Leight Max I are the other of the most effective snoring earplugs that I came across. They have the highest rating of 33NRR. They almost totally isolate you from the irritating snoring noise and other noise out there. They are made from soft polyurethane foam and have a smooth finish making them soft and comfortable to sleep in. When I started off, I was worried that the earplugs might go too deep. If you have the same worry, what you need is the Howard Leigh Max1 earplugs. They are shaped like a bell. This kind of design makes it harder for them to go deeper into the ear than you inserted them. They are also contoured making it difficult to fall. It also makes it easier to insert and remove compared to the conventional earplugs. What I loved most about Flents super sleep earplugs is their length. 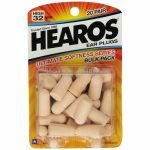 They are a bit shorter than most earplugs making them ideal for side sleepers. I could comfortably sleep on my side without any extra pressure on my eardrums. They are made of soft foam. They are soft and comfy to sleep on. Super Sleep Comfort ear plugs are equally easy to insert and remove. Like other ear plugs made of foam, they expand to the size of your ear canal. You don’t have to worry that you will have to wake up at night to put them back. They fit in properly without falling off or leaving space. There are two kinds of best earplugs for sleeping that exist today on the market. There are the active and the passive ones. Passive devices are classified as earplugs, auditory canal caps, earmuffs, and helmets. The classification is done according to the way they seal the ear. Sleeping earplugs that are inserted into the auditory canal are usually “one-size-fits-all” earplugs and demand to be squeezed before or upon insertion. They are constructed with materials such as slow-recovery polyurethane or polyvinyl foams, whirled fibreglass, paraffin and beeswax-based products. After manufacture, these earplugs are then putty inserted inside a soft plastic case. 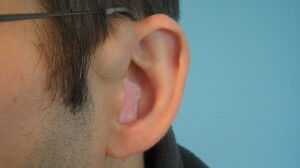 A user has to compress the foam earplugs and insert them into the ear canal before they regain their original shape and fit the size of the ear canal. Because their original size is bigger than that of the ear canal itself, the fact that the earplug get back its original size creates an acoustic seal. 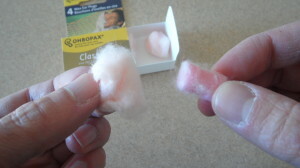 Examples of foam earplugs are the SparkPlug by Moldex and the E-A-R Classic PVC foam. These are slow-recovery devices that are compressed before inserted in the ear canal. Examples of the best earplugs for sleeping that do not need to be compressed before insertion are the Ultrafit by AEARO-3M and HOWARD LEIGHT Fusion. With these earplugs, you only require to push them into your ear canal without compressing them first. Note: Paraffin and beeswax earplugs require to be pre-molded first by the user and then inserted in the ear in a way to deform them to fit the ear canal. One of the advantages of custom-molded sleeping earplugs is that they are found as either passive or active devices. The custom-molded earplug is produced according to the specific dimensions of your ear canal. This allows it to be used as a passive device. It provides a relatively good attenuation since the impression is made with a dam deeply inserted into the ear. Many companies now create earplugs with a small hole in it that can be fitted with various sound filters which give the earplug different levels of attenuation. The hole can also be fitted with electronics that can provide better protection such as noise cancellation, electronic filtering, etc. When searching for the best ear plugs for Sleeping there are two main points that will need to be considered. They need to be extremely comfortable. The best types will mold into your ear so naturally and easily that you won’t even notice that you have them on when wearing them. The ear plugs are going to be worn for approximately 8 hours every night so it’s imperative that they won’t be irritating to wear. They need to be effective at blocking out noise enough and at the right level for you to not be disturbed. When trying to find out more about the best ear plugs for sleeping you will likely hear the term ‘NRR’ thrown about a lot. This stands for ‘Noise Reduction Rating’ and is a rating for exactly how much noise will be blocked out. Generally, the higher the NRR is the better the earplugs will be. Nobody can ever tell you how much is enough for you and you must find this out for yourself. However, most of the time in my experience it’s more important to get comfortable earplugs for sleeping over less noise. Nearly all ear plugs will block out sufficient amounts of noise to allow you to sleep. There are three main types of ear plugs you are likely to look into when searching for the best ear plugs for sleeping. 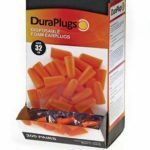 Wax Ear Plugs: these types of ear plugs are more specialized, usually non-reusable and generally not a personal favorite choice when it comes to ear plugs for sleeping and I doubt that they would be your favorite.. Personally, I have used them and love them so if you would like to find out more about them check out my page on wax ear plugs for sleeping. Silicone Ear Plugs: types of ear plugs start out as basically flattened cylinders. Your job is to then bend them into shape and fit them over the top of the ears opening. Their main purpose is for swimming, to block water from entering the ear. However, some people much prefer them over any other type of ear plug for sleeping. As I mentioned before, it seems to always be down to the specific person using them. Be sure not to stick them inside the ear canal as they are designed to cover the ear entrance and putting them inside the ear could potentially cause problems. Removal is usually pretty easy, it’s just a case up tilting the ear plug from underneath and sliding it away from the ear. 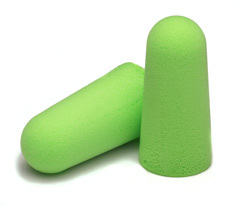 Foam Ear Plugs: These type of ear plugs usually come in somewhat of bullet shape, but can vary in shape and appearance. The level of noise reduction depends on how densely the foam is packed. The packaging will usually let you know what the NRR for the Ear Plugs is. They are usually squeezed straight into the external part of the ear canal. Once there these ear plugs will expand to fit your ear and should block out noise sufficiently for a good nights sleep. They will then be removed by pulling out the flat end. The only real problem I found with cheaper versions of these is that the flat end sticks out a bit and you tend to be very aware when lying on your side that you have ear plugs in your ears. Foam and Silicone versions will generally be found in most pharmacies and big stores. Just ask at the desk about the range that they offer. 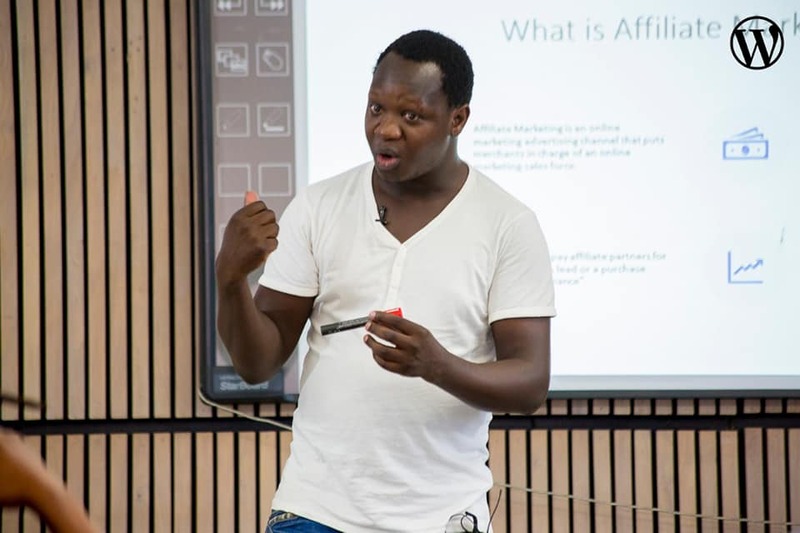 When buying online just search the main stores of the different brands available. Another option is to buy off of places like Amazon. Read the product reviews as these are usually an absolute gold-mine. There is no better experience than personal experience. See what people are saying about them and if the reviews are over 90% positive and relevant to your needs it would definitely be worth purchasing. If you are somebody who has already tried basic earplugs and is looking for the perfect, top of the range and suitable ear plugs for regular, long term use it can sometimes be a good idea to try various samples of different types of ear plugs until you find the best pair for you. Companies often sell sample packs or even give free samples away for people to buy. Silicone versions tend to be slightly more expensive than foam, both types last approximately up to about one to two weeks if used regularly. The first wax ear plugs is believed to have been created in ancient times. Since then, little has actually changed. Wax is still used, along with other materials such as cotton, to produce high quality earplugs. The best thing about using wax in the making of earplugs is that once inside the ear, the wax is heated up by the body’s heat. This rise in temperature of the wax, caused by the temperature of the body of the wearer, makes the wax into a protective seal with the inside of the ear canal. The created seal prevents noise, water, or anything else from getting in the ear. Wax earplugs are also used quite a lot by flyers. The seal formed by the wax in the ear gives the air pressure in the inner ear some time to equalize with the outside air pressure. The discomfort in your ears that is felt during takeoff is actually the results from the inner ear not keeping with the rapidly changing air pressure in the cabin. With a wax seal correctly in place, air is prevented from moving too fast inside your ear and causing that unpleasant discomfort. 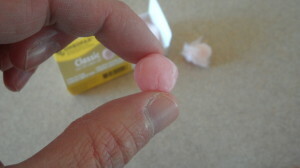 The unique formulation of wax earplugs: cotton wool soaked in a mixture of Vaseline and paraffin wax, is so perfectly right from the outset that it has remained practically unchanged up until the present day. The ingredients in wax earplugs are all gentle to the skin and hypoallergenic. The wax earplugs can also be perfectly adjusted to fit every auditory canal and reduce the effects of noise on the ear. The comfort of the earplug is excellent as no sensation of pressure occurs in the ear. The used material in the making adheres well to the ear and enables a secure positioning. The flesh-colored earplugs also looks very discreet when worn! 1. First, completely remove the protective cotton wool with clean fingers. If needed, you can reduce the size of the ear plug by tearing-off a small amount of its material. 2. Discard the protective cotton! Mold plug to soften and shape into a coherent ball. Place the ball over the auditory canal and flatten firmly. Do not insert deeply or use too small a piece. 3. To remove the ear plug, press up­ward behind the ear to loosen. Then remove plug with fingers. Never use hard or pointed objects to aid removal. The best silicone ear plugs for sleeping are usually are flat soft disks, with a rubber-like feeling. They are used in a lot of various ways including for blocking snoring noise from your roommate. Silicone earplugs are a little bit more expensive than other regular disposable earplugs, but because some people believe that they offer more bang for the buck, it makes the extra spending acceptable. The first reason to use silicone earplugs for sleeping is because of their memory factor. This trait helps it to fill the inside of the external ear canal, making a complete and comfortable fit. Being soft and easy to mold makes it also very easy to insert and remove without danger for the ear. Silicon is also an inert and nontoxic component. Silicone earplugs are said to be reusable a couple of times until they are either dirty or that they don’t stick to the ear anymore. It has been said on the web that since they are resistant to heat, they can be put in a dishwasher or boiled in a sterile solution for cleaning. Silicone earplugs come in a variety of shapes an colors. Most of them are semi-transparent and comes flat in small plastic box. Silicone earplugs block out noises very effectively. They can and are used by people who work in high noise environments primarily to limit the ear to exposition to loud noise to prevent hearing loss. Being soft and not going inside the ear canal, they are very comfortable for people who wish to use them at night for snoring release and street noises. A second use for silicone earplugs is to prevent water from going inside the ear by completely sealing the ear. They are used by swimmers, divers, and people doing aquatic sports. Silicone ear plugs must be inserted and removed with care to prevent damage to the ear. It is especially true for silicone earplugs as if they get inside the ear canal, you might need the help of an ear professional to remove it as it cannot be dissolved like wax earplugs. 1. First, roll and mould the earplug between fingers to soften and shape into a coherent ball. 2. Place the ball over the auditory canal, flatten firmly and hold it there for a moment for the silicone to molds to the area. DO NOT FORCE THE PLUG INSIDE THE EAR AND DO NOT INSERT DEEPLY! 3. To remove the ear plug, press up­ward behind the ear to loosen. Then remove plug with fingers. Never use hard or pointed objects to aid removal. Removing the plug too hard or too fast can provoke damage to hearing. Different types of foam earplugs are available on the market today. The most common is the foam earplugs that is made of memory foam, which is rolled between fingers to a smaller size so that it can be inserted into the ear canal where it regain it’s original size though creating a perfect seal. Memory foam is made of polyurethane mixed with other chemicals to increase its viscosity and density. Most earplugs memory foam become soft when heated by the body heat, making it possible to perfectly mold to a warm ear canal in a few minutes. It provides the best combination of comfort and protection for most users. The second type is the push in type, or, as they are called sometimes, the Pod Earplugs. These earplugs are the easiest to install since there is no roll needed. You just have to use the soft flexible grip to push the earplug into position to obtain a perfect seal. The unique design of these sleeping earplugs allows the foam to compress easily so that the plug slides gently into the ear and expands slowly. Since you don’t have to touch and roll the plug between you fingers, it makes them the most hygienic plugs on the market. 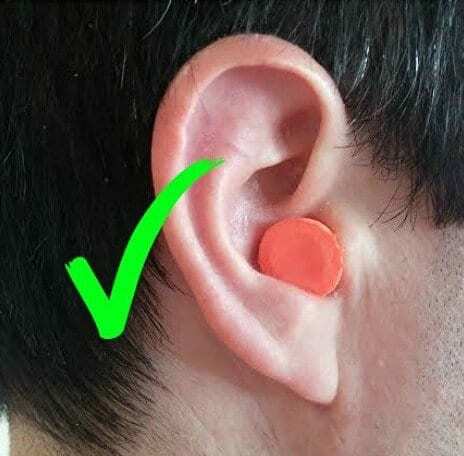 For people working with earplugs in environments where it is important that the plugs doesn’t fall into the produced goods (especially with food products) or that needs to put on and remove the plugs often, most all of the foam earplugs comes in a corded version. The cord is long enough to go all around the back of the neck. For people working specially in the food industries, there are metal detectable earplugs that are made with a small metal ball inside so they are detectable in an industrial metal detection unit for easy compliance with food industry regulations. 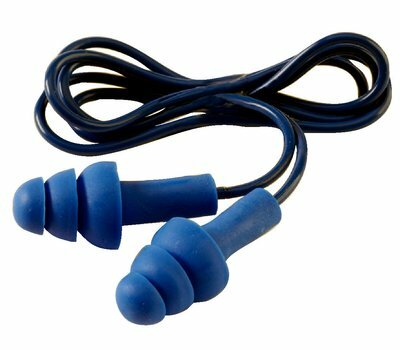 Metal detectable earplugs generally feature blue ear plugs and/or blue cords: blue is the only color classified as a non-food color in the food industry. 1. With clean hands, roll(don’t squeeze) the earplug between your thumb and first 2 fingers until the diameter of the plug is as small as possible. 2. Reach over your head with the opposite hand and pull the top of your ear to open the ear canal. 3. While you are holding the ear open, quickly push the rolled end of the plug into your ear, leaving enough of the ear plug outside the ear to allow removal. 4. The disposable earplug should now be properly positioned in the ear canal. For best fit, at least 1/2 to 3/4 of the ear plug should be inside your ear canal. Removing ear plugs For greater comfort, twist the plug gently to break the seal before removing the plug. One of the greener and economical earplugs for sleep are the Pre-molded earplugs. These earplugs are are usually made of silicone rubber, vinyl and other hypoallergenic synthetic rubbers. Some of them are even made of a special type of foam with a special film cover protecting the inside foam. They come in different size, shapes, colors and some are corded and others not. Some come with a handy carrying case that lowers the chances of losing them and helps to keep them clean. 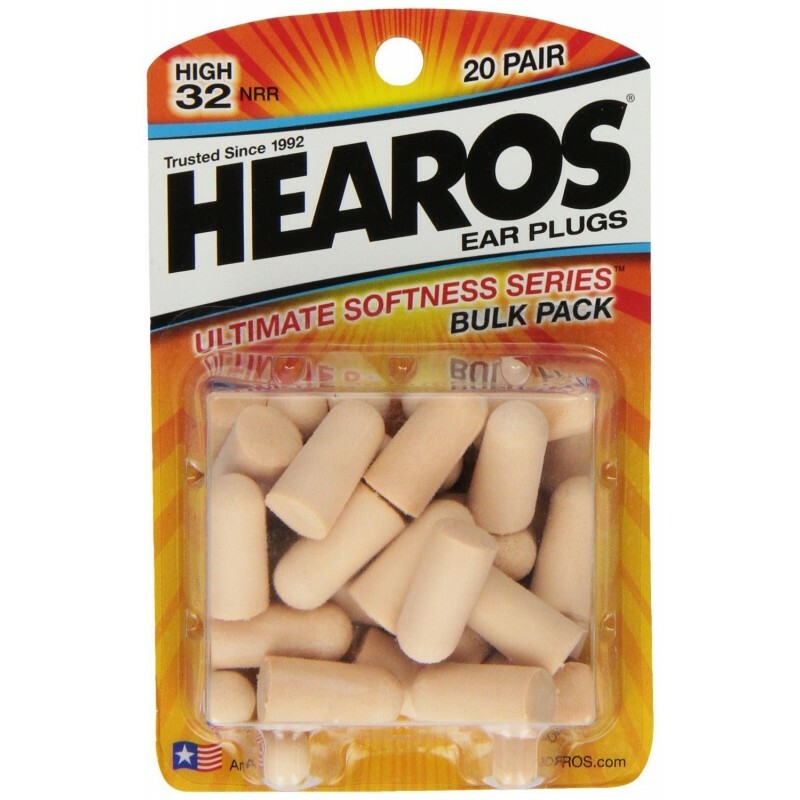 There are many type of pre-molded earplugs available on the market. One of the major differences between pre-molded earplugs and regular foam earplugs is because for the pre-molded earplugs, size does matter. Since you don’t actually roll them between your finger to insert them in your ear but simply push them inside, you have to actually find the perfect size for you. 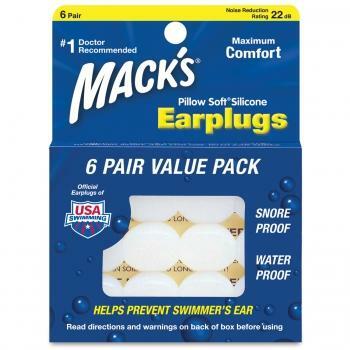 Many pre-molded sleep earplugs come in trial packs of 2 to 3 different sizes so that you can find the perfect fit and perfect seal for your ear canal. Some people even need one size in one ear and a different size in the other, which makes the trial packs very handy. Although the size, seal and comfort is one of the factors to consider when choosing the best earplugs for snoring, you have to keep in mind that one of the most important element of the earplug is the NNR rating. It is that rating that defines the quantity of noise the earplug will stop from going into your ear. Most of them comes with different numbers of flanges, but there are some that do not have any. Pre-molded earplugs can be re-used over and over again as long as they are properly cared for. They should be cleaned in soap water after every uses. They can also be cleaned using rubbing alcohol. Of course, when they begin to show signs of wear and tear and are beginning to lose their original form, then it is the time to throw them out and get a new pair. Now that we have reviewed the best earplugs for sleeping, let’s get into the mundane details about earplugs in general. This is information that you absolutely don’t need, but it doesn’t hurt to know. Do you know when the best earplugs for snoring were first mentioned in history? Well, the first recorded use of wax earplugs is in the Odyssey! Odysseus’s crew used wax earplugs to avoid being distracted by the Sirens’ songs! It was an inventor named Max Negwer, in 1907, that started the German company named Ohropax which still produce the famous original wax earplugs they used to produce. Since then, they have added a few other products to their catalog. About 45 years ago, in 1967, the company National Research founded by a scientist named Ross Gardner Jr. created the first earplug out of an accident. Gardener and his team discovered earplugs as a byproduct of a project called “joint sealants.” Gardener was developing a resin that had unusual properties of energy absorption. Today, sleeping earplugs are currently manufactured by around 25 different companies and can be bought nearly everywhere on earth. The principal manufacturer, Howard Leight, reports annual sales of around $130 million. I sometime wear my best earplugs for sleeping even when there is not so much noise around or even when I am not actually sleeping. They still gives the pleasure of calming the world around you to the point where you can hear your own thoughts. I am actually wearing a pair as I write those words! Is your partner's or roommate's loud snoring keeping you awake at night? Relax. We have reviewed some of the best earplugs for sleeping with a snorer. With any of these top rated sleeping earplugs, none of the noise can get through your ears. First of all thank you for this article which is quite clarifying for someone who needs to get sleeping earplugs for the first time. After reading your article I was decided to go for the Hearos Ultimate Softness, however after reading reviews on Amazon it appears that their design has changed and a lot of people are complaining about the new design. It appears your review is for the old design of these earplugs, so I’d like to alert that perhaps the review isn’t entirely accurate for the new ones. Also, it would definitely be interesting to have the new ones reviewed and compared to the old ones! I have tried a couple of the earplugs you have listed. I am wearing a pair now. They don’t work against my husband’s snoring. I can’t hear anything else in the room but my husband’s snoring is just too loud. I’m at wits end with this. Now I see why people get divorced over snoring. Kyoko, I felt the same way until a doctor did a sleep study on my husband (no sleep apnea was detected) so he recommended that my husband lose 15 lbs. Well, he lost the weight and not only does he look great but has completely stopped snoring! I am astounded that it worked and I’m finally getting a good night’s sleep. If your hubby can stand to lose a little weight, it’s worth a try to see if his snoring improves. I’m travelling with a friend soon who had me sleeping in the bathroom last time his snoring was so loud. Also went to a doctor who said he didn’t have sleep apnea but also doesn’t have much weight to loose. Looking for the best option. For determining the comfort levels related to earplugs that get used while sleeping, trying it while lying down is the idyllic way. The pressure caused on the ear as experienced between that of head and pillow might bring down the comfort levels. Moreover, while the head gets tilted back or to the side, it produces considerable anatomical changes in that of the ear canal, as in most cases it is the reduction related to the diameter of the ear canal, which might bring down the comfort levels in cases of earplugs being too large. I hate loud noises, and I do have a snoring husband. Man, he could wake the dead. However, my question or concern relates similarly as I can not sleep when it storms. Would the same hold true or do you have any suggestions?I’m a stomach and side sleeper. Thank you for such a good article of information.